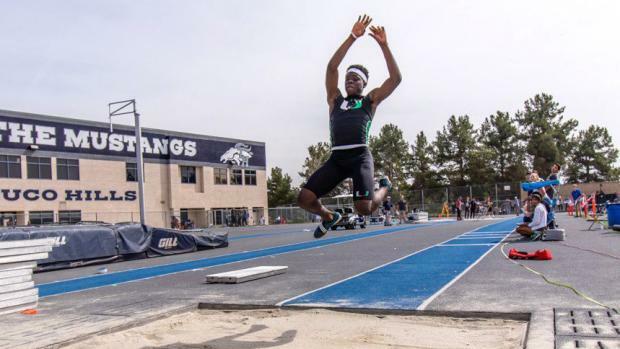 Upland (CA) junior Namir Hemphill is the current US No. 2 all-conditions combined jumper. Photo by Frank Bellino. The current nation-leading combined long and triple jumper is Homewood-Flossmoor (IL) High School's Quinton Stringfellow. The senior has the top combined wind-legal mark of 72-8. He competed in both the long jump and triple jump going 23-2 and 49-6 at the Mt. Carmel Invitational in San Diego, California. Stringfellow's marks are also the top combined all-conditions marks as well. Check out both the top combined wind-legal and all-conditions horizontal boys jump lists below.